Dr. Rizhi Wang is a Professor in Biomaterials at the Department of Materials Engineering, University of British Columbia, Canada. He is also an associate faculty member at the Department of Orthopaedics, and a theme co-leader in surgical solutions at the Center for Hip Health and Mobility. Dr. Wang received his Bachelor’s degree in Materials Science and Engineering at Zhejiang University in 1983, and a Ph.D. in Materials Science and Engineering at Harbin Institute of Technology, China, in 1993. Before joining UBC as an Assistant Professor in 2001, he worked as a post-doctoral fellow at Tsinghua University (Beijing) and the Weizmann Institute of Science, as a Labsy Visiting Professor at the University of Minnesota, and as a research associate at Princeton University. 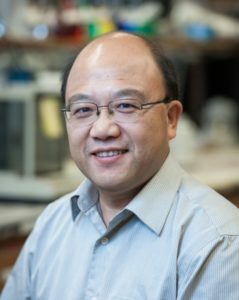 Dr. Wang held a Canada Research Chair in Biomaterials from 2002-2012, and served as the president of the Canadian Biomaterials Society in 2012-2013. Dr. Wang’s research interests are Biomaterials, Biomechanics, and Biomimetics. In Biomaterials, the focus has been on the surface and interfacial issues common to most biomaterials systems. One research direction is aimed at developing novel surface designs and processing techniques on metal implants. Bioactive ceramics, proteins, drugs and their composites with specific functions are being processed on implant surfaces to regulate cell response and tissue organization and to promote time-implant integration. Fretting-resistant and corrosion resistant coatings are being developed to minimize implant wear and corrosion and to prevent adverse tissue reactions to implants. Antimicrobial molecules are being studied to prevent implant-associated infection. The overall goal of the implant projects is to improve implant longevity. In Biomechanics, the interest is deformation and fracture mechanisms of the bone family materials (i.e. bone and teeth). The goals are to understand how bone structures, from nanometer scale to macro scale, are adapted to their complicated and dynamic mechanical functions; and to apply the knowledge to solve challenging clinical problems such as hip fracture and implant/bone fixation. In Biomimetics or Bioinspired materials, the current research focuses on the morphology, ultrastructure and mechanics of biological interfaces, based on which novel surface and interface designs can be developed.